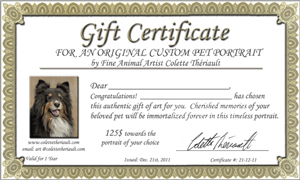 A Pet Portrait Gift Certificate truly makes a unique gift for you or a special person. Birthdays, weddings, anniversaries, retirements, graduations and Christmas are perfect occasions to give a memorable gift that will be cherished for years to come. If time is short and a special date is fast approaching, why not give a Pet Portrait Gift Certificate? Convenient and easy to purchase, you will save time and money while giving the recipient the opportunity to be involved in the creation of a portrait of their beloved pet . Please note: Gift certificates are valid for 1 year from the date of issue to encourage redemption in a reasonable timeframe. However, gift certificates will be honored past the 1 year mark but the recipient should contact me to make arrangements within the 1 year timeframe. Gift certificates have no cash value which means they are non-refundable. You decide the value of your gift certificate. Review the information below and select the option you want. You may also change the quantity of a particular certificate to order more than one or to increase the value of a certificate. To change the quantity, you will need to add to shopping cart first. You can also add a "note to seller" once you are processing your payment information. Gift certificates are mailed (free shipping) to you or the recipient if you choose. Please allow 5-10 business days for certificates mailed within North America. If time is short and you need the gift certificate right away, I can email you a jpg file as an email attachment and you can print it at home. Portrait type ex. cat, dog etc.